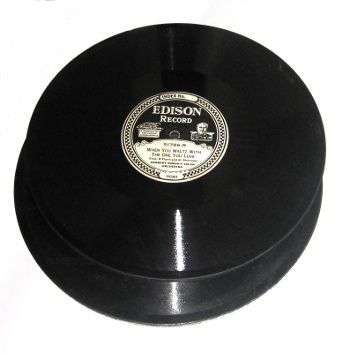 Call them what you will -- thick records, Edison records, Edison Re-Creations, most collectors refer to these as Edison Diamond Discs to distinguish them from Edison cylinder records. The Diamond Discs, which were engineered to run at 80 (not 78) rpm, should best be played on an Edison machine with an Edison reproducer and an Edison diamond stylus. Whatever you do, do not play them with a steel needle on your Victrola. These records were composed of a laminated composition, and over the years tend to delaminate and to chip away at the edges. I have tried to note any damage to the record, and have tried not to list any records that are warped or delaminating, and I have tried not to list any records with rim chips dangerously near the grooves. I've also tried to note the rim chips, but small rim chips are so common that I may have missed a few in the descriptions. Ratings are as follows: F, fair. A record with heavy static or other damage, but which may be desirable nonetheless for its historic or musical value. G, good. A record in average condition. May have some wear, scratches, or static, but still playable and enjoyable. VG, very good. A record in somewhat better than average condition. E, excellent. Not a mint record, but a record that appears to have been very little played. In most cases, I have graded the record not only by appearance but also by listening to a portion of it; sometimes a record that appears to be clean will play with heavy static. I have not listed such records. NAP -- not affecting play. Records can be sent Media Mail (US only) at nominal postage. I would be happy to cut a partial mp3 for any record priced $50 or over that you may be interested in purchasing. Please be advised that because of the time involved in handling records, and the cost of bubble wrap and other packing materials, I have reluctantly instituted a minimum purchase of $20. If your order comes to less than this you will be charged a handling fee equal to the difference between the amount of your order and the minimum purchase price. Feel free to select a couple of extra records to bring your order up to the minimum purchase. The minimum purchase will be waived for repeat customers. Click on any field below to sort the records. Pick-up and delivery possible in many parts of the midwest,south, and northeast.